After seeing the following video, which I imagine will soon go viral, I tended to draw two conclusions: firstly, that person seems to not be aware that it’s never a good idea to slap an immigration officer in an Asian country and secondly, if you overstayed your visa for that long, how much vacation do you have? Or are you by any chance on benefits? Here’s the story. Ms. Auj-e Taqaddas, a tourist with British nationality, arrived at Ngurah Rai International Airport in Bali, Indonesia this weekend. After receiving her boarding pass for the flight back to Britain, with a stopover in Singapore, the local immigration officers noticed that she had overstayed her visa and, importantly, that they had sent her several letters to remind her of this. 42-year-old Ms. Taqaddas had in fact arrived around the new year already. Her one-month tourist visa had expired on 18 February after which immigration sent her a letter, warning that she needed to regularize her visa or pay a $25 fine for each day she overstayed. Another letter was sent one month later, and so on. In the end, Ms. Taqaddas stayed illegally in the country for more than 150 days which amassed to a $4,000 fine. The immigration officers told her to pay or she would have to miss her flight. As she was unable to do so, she needed to run off to a local bank and arranged a cheque. 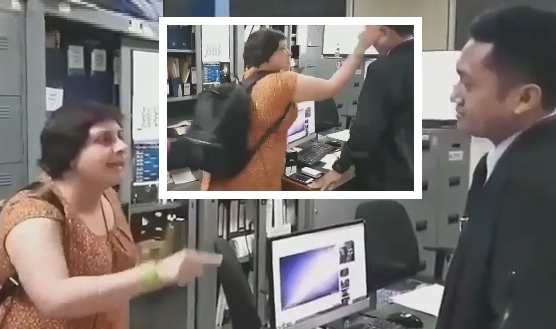 Returning to the airport, she found that she had indeed missed her flight and got into a fit of rage versus the immigration officer whom she paid the money to, slapping him in the process (an illegal offence in Indonesia, and, for that matter, I’m going to guess in any other country as well). Ms. Taqaddas was taken to an immigration holding cell in the meantime. The British Foreign Ministry did not want to comment. Related coverage: <a href="http://thegoldwater.com/news/32869-UK-Youths-Who-Attacked-Disabled-Elderly-Woman-For-Fun-Receive-Police-Protection">Suffolk youths who attacked disabled elderly woman receive police protection</a>. she looks like a lot of "fun"
She's not British…she's a transplant who behaves like the third world trash she came from. Ha! Get that tnuc the frig out of blighty please! if she overstays her visa in the USA they'd give her free money, room and board and NPR would do a sob-story about this poor poor woman….